Not only does the Kid's Tablet come with 8GB built-in storage, but you can also expand your storage up to 32GB with a Micro SD card! You can transfer music, pictures, and games, giving you the freedom to have even more on your tablet. 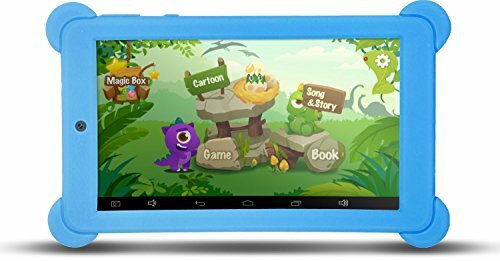 With a high resolution 7" screen with 1024 x 600 pixel clarity, the Kid's Tablet will make everything look sharp and lifelike. Browse Facebook, play your favorite game, watch your favorite movie, all on this beautiful screen! Enjoy fast speeds of up to 1.2GHz with the Kid's Tablet's Quad-Core processor. New and improved over the previous generation processor, you'll experience 2x better performance, all with the same battery life!